Could You Run A Charity Marathon? And get training for this year's charity marathon! usually after just having watched that year's event on TV! For most people that ambition falls away as normal life intrudes on their daydreaming and somehow a whole year has passed and they find themselves once more watching the whole spectacle from the comfort of their sofa! There are some people for whom the dream becomes a reality. An achievement that will be with them for the rest of their lives. If you ready for a real challenge? If you feel able to commit to something a bit more time consuming and serious. If you want to take part in something really special. Then maybe running in the event is a goal worth going after. "There is nothing quite like it!" Running for charity is not for the fainthearted. The run itself is 26.2 miles of punishment. To reach the required fitness levels a person of average ability will have to commit to a regular training regime for at least 6 months before the event. Perhaps longer if your current idea of heavy duty exercise is carrying the biscuit tin back to the kitchen! There are plenty of training regimes you can follow. And advice websites are falling over themselves telling you how to do it. Its up to you to use the ideas you think will work for you. For some people training is a solitary exercise. Others prefer to train with friends. Or even join a running club. Be in no doubt however that training will require you to put in the time and the miles! Being allowed to take part in many of the larger events is by no means guaranteed. Competition for places is fierce. You need to register as soon as possible. The governing organizations begin to process new applications for next year's race the minute this year's has been run! Application procedures vary and can depend on ability and performance in previous events. Some organisers use a ballot system. As well as the majors there are of course any number of still quite significant events taking place in towns and cities all over. Sometimes by running in these events you might actually be able to gain extra sponsorship money from local businesses etc. As well as a hard regime of training you should not neglect to ask friends and family for sponsorship. 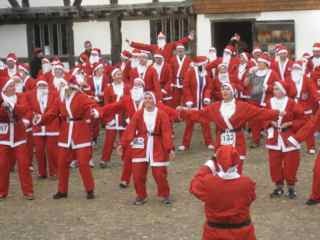 Usually your charity or cause you are running for will be able to help you out with an appropriate sponsorship form. This is not a time to be bashful. The whole point is to raise money so don't be afraid of asking. If your good cause is not well known make sure that you know a little bit about it. As well as family and friends don't neglect to ask around at your workplace. Most companies love their employees to undertake activities for charity. There may be a notice / bulletin board where you can put a poster. Some companies also have a weekly staff bulletin or ezine - if so make sure you get featured. 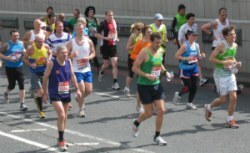 Most marathon runners will ask for sponsorship to complete the entire course. Often donations will come in in advance. If you can keep it safe a simple collecting jar can be a quick and simple way of hoovering up spare change particularly in the workplace. Another increasingly common strategy is to set up an online donation page. This offers a secure way for people to donate to you online. The advantage of this is that you can spread your fundraising ask far wider and also tie it in with facebook and other social media. Donation pages work particularly well for marathon runners and are very easy to set up. Dont restrict yourself just to sponsorship - There may be other fundraising activities that you undertake in advance of the event to whip up excitement and add to the pot. For some running a charity marathon is a very serious business. For others just getting around the course is challenge enough. More confident runners however often dress up a bit. Usually this is just for a bit of fun but it can increase your donations and may make asking for sponsorship easier. This has become a really popular fundraiser for all sorts of groups. Running in a charity marathon is not easy, but it is a fantastic experience. So if you are prepared to make a real commitment to your cause. Put on your running shoes............ and go the extra mile!